To start this week’s Indie Game of the Week off, I’ll give you folks a recipe. Take one part Metroid, and mix it together with a liberal dose of Castlevania. 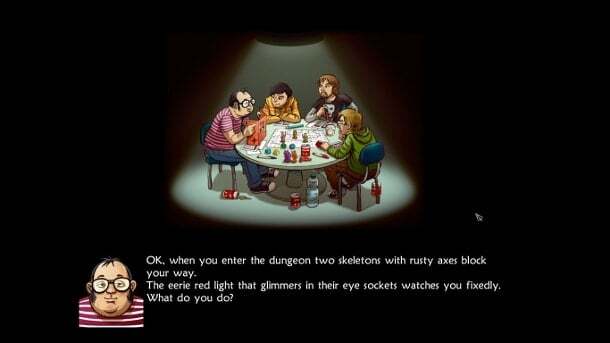 Toss in Dungeons & Dragons, add a pint of beer, and sprinkle with comedy. Simmer over an open flame until overdone. That’s pretty much the best way to describe Unepic, this week’s indie spotlight. It tells the story of Daniel, a hapless D&D player who somehow manages to be transported into a strange, evil castle on his way to the toilet. Naturally, Daniel doesn’t quite believe his eyes, and remains convinced that the whole castle is little more than a hallucination; that his friends spiked his beer with something very, very powerful(eventually, he learns otherwise). What follows is a Metroidvania-style platformer filled with off-color humor and pop culture references. Daniel quickly finds himself possessed by a spirit named Zeratul, who finds, to his dismay, that he cannot control the player (he evidently has no faith). There’s a simple solution to that, of course: he’ll be able to escape his prison if Daniel dies. The two shortly begin a constant stream of banter, with Zeratul trying to get Daniel killed at every turn, and the – understandably genre-savvy – Daniel shutting down his every effort. Although the game’s tone is most definitely comical, there’s a surprisingly decent narrative hidden underneath all the Easter Eggs and geeky jokes. I won’t spoil too much, but suffice it to say, it’s actually a fairly satisfying experience. There’s a lot more to this gem than meets the eye – and I’m not just talking about secret treasure. Narrative aside, Unepic is a fairly deep and complex game. There’s over two hundred rooms to explore in the castle, with a massive map that lets players edit, draw, and write on it(very useful for noting down the location of merchants, bosses, or other points of interest). Further, a player can choose to specialize in any of a wide array of physical weaponry or even magic. Each time the player gains a level, they can choose to put points into a particular weapon or magic type, along with constitution and armor. Factor in a potion brewing system and a metric tonne of loot, and you’ve a recipe for success in a dungeon crawler. The addition of warp doors along with teleportation scrolls and spells is welcome, as well. It cuts down considerably on grind time, and makes backtracking considerably less frustrating than it would be otherwise. Same deal goes for the hotkey system, which lets you assign a one-button shortcut to every single item you find. Oh, and for all you junkies: yes, there are achievements. True to form with any title inspired by the dungeon-crawling platformers of old, Unepic also features a number of massive and terrifying bosses. There’s a few tricks to taking down each one; unfortunately, you may have a little trouble with several of them depending on what weapons you’ve chosen to specialize with. Still, they’re beatable, with some difficulty. All told, Unepic is a positively fantastic platformer, with over twenty hours of content, an entertaining and enjoyable story, and very decent gameplay. There’s more coming, too: currently, the title is in open beta as the developer tests out a multiplayer offering, which includes a seven dungeon co-operative campaign and several different PVP game-types. Oh, yeah…did I mention this whole game was designed and developed by one guy? Not bad, eh? You can pick up Unepic on Steam for $8.00. Considering there’s over twenty hours of content in the game, that’s definitely worth it.